Taft College has partnered with BankMobile Disbursements to deliver financial aid refunds to students. BankMobile Disbursements is a financial services company focused on helping students get the most out of their money. 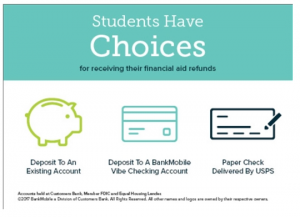 BankMobile is committed to delivering 100% of the financial aid refund, keeping data secure, allowing students to change refund preference at any time and providing students with clear choices. Signing up for Mobile Alerts with BankMobile is also an option, so you may be notified when your refund has been disbursed. We continue to strive to provide students with the most efficient way to receive the financial aid funds.